Questions about the start of basketball season arose recently when the Interscholastic League of Honolulu decided to start tryouts and practices on Monday. The private-school league is starting earlier than usual, while the public-school Oahu Interscholastic Association won't start until later. The OIA girls season cannot start until next Monday, while the OIA boys won't begin until November 12. Why the difference? The ILH includes intermediate-age sports, which was workable when the boys played basketball in the winter and the girls followed in the spring. Now that the girls are playing hoops in the winter, there is a scarcity of gym time. ILH basketball co-coordinator Bill Villa has been at work trying to find solutions for the league and his school, Mid-Pacific. Anticipating the crunch of scheduling 500 games, the ILH formed a committee to study the challenge over the summer. Their conclusion contained several key elements, including a shorter schedule for Division II schools. The so-called "big schools" -- Kamehameha, Punahou, Iolani and Saint Louis -- won't field D-II teams anymore. Instead, their "B" teams will play in a Division I-AA classification of their own, with only a handful of regular-season games. The remaining D-II schools, 10 in all, will continue to play a single round-robin before a postseason single-elimination tournament. They will have just nine regular-season games instead of 13 or 14. That adjustment, which pertains to both girls and boys basketball, saves the league valuable gym time. Instead of about 500 games, there will be only 300 to 400. The biggest reason, Villa said, for starting earlier was a matter of necessity. At first, the committee thought that moving intermediate and junior varsity to an Oct. 29 start would eventually benefit the varsity in terms of gym time. However, having JV and varsity tryouts and cuts at different times was not a realistic possibility, Villa noted. So, the league moved all three levels back to an early start, even if many hoopsters are still playing fall sports. Villa knows the ripple effect of the HHSAA's decision to move girls basketball state tournaments to the winter is being felt most by the younger teams. "It's a little frustrating. They want to give these kids the time, and they're trying to make the best of it," he said of intermediate basketball coaches. Though varsity teams still get priority, scheduling practices and communication between girls and boys coaches at different levels is of great importance now more than ever. "At Mid-Pacific, we're gonna make sure varsity is not affected too badly. But instead of six baskets to shoot at, now they have half a court and three baskets to shoot at," Villa noted. "I would imagine that it would be a portion of the reason (to cut teams). We're struggling here to field teams in our facilities. I can imagine at the larger schools they have the same type of problem, and maybe a bigger problem." Over at the OIA, girls basketball coordinator Mel Imai hadn't heard any complaints about the ILH's earlier start. OIA girls will begin regular-season games on Dec. 18. The boys will begin league games in early January. The girls state basketball tournament will be held one week before the boys tourney. Imai doesn't see any reason to doubt the ILH's intentions regarding an early start date. "I don't see anything from anybody trying to skirt issues. Everybody's just trying to do their jobs," the longtime Kailua athletic director said. The renovation of Roosevelt's football field begins tomorrow. Steve Baginski of Kaikor Construction says the project will be completed in time for the school's graduation ceremony in May. The facility will be christened Edmund "Ticky" Vasconcellos Stadium by then, in honor of the former coach and athletic director. No word yet on where the Rough Riders track and field team will practice when the season begins in the spring. The senior running back rushed for 313 yards and four touchdowns on 30 carries against No. 2 Punahou. » James Pirtle, Pearl City: amassed a 1,451-pin total to win the OIA individual boys title. » Emily Maeda, Roosevelt: 10 kills and two assists against Mililani. 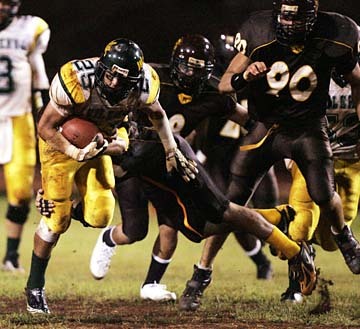 Rico Newman tried to get through a Mililani defender during Leilehua's playoff win last week.